A white beam with a Christmas Tree is about to be raised atop CPMC’s Cathedral Hill hospital that’s rising at Geary and Van Ness. And once welded into place, the beam will officially mark the “topping out” of the structural steel for the project which is currently being celebrated in the white tent below. 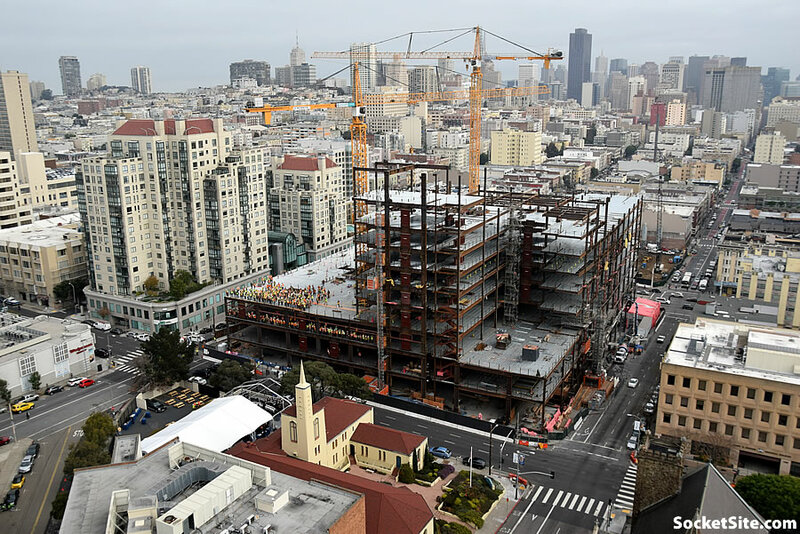 CPMC’s Cathedral Hill campus, including the 250,000-square-foot Medical Office Building to rise across the street, is slated to open its doors in 2019. Well, you then you simply don’t understand health care planning. I have been a designer on several large urban hospitals and large open floor plates are critical to a hospital functioning well, NOT increased height. Just building higher and higher because you and others worship unlimited height limits does not work for every building type, especially hospitals. clearly you don’t either. see socketsite editor post below where original building was planned higher with ~250 more beds. Of course I know that. Fact is, many on the client side did not want the increased height limit and beds, for a number of reasons, including functionality and profit. Yes, there are high rise hospitals elsewhere, such as NY where that kind of height and density is APPROPRIATE. So it had nothing to do with healthcare planning, then, but rather some vague notion about what height is “appropriate” for aesthetics. No, of course not. You don’t read very well. I SAID: including functionality ( hospital efficiency) AND profit: too many empty beds results in loss of income. And the hospital wanted to build taller until they were forced to cut the height. Are you now switching tunes to say that government central planning knows how to run a hospital better than the hospital that wanted a taller building (and the efficiency that comes with a larger facility)? So, it’s not appropriate here… except that the hospital itself originally asked for higher, and was shot down… so, had the hospital gotten its original ask, would you be on here now arguing that it’s too high and *in*appropriate?! The size of this hospital was cut from the original design not because of any of the reasons you all are batting back and forth but because the nurses and service workers unions forced it as part of a package to ENLARGE the owner’s other new facility at St. Lukes in the Mission: Fewer beds here, more in the Mission where arguably population growth is even higher. Personally, I would have preferred them to maximize capacity at both locations but if that wasn’t an option the decision reached may have been best. Um, the city was ACTIVELY involved on the side of the unions, if you remember? What kind of union argues against more demand for its members’ job skills?! The worry was that if St. Luke’s wasn’t enlarged at this time then it would be an easier target to close later on. Having two big hospitals is safer for the union that having a really big one and a medium one. They’re just looking to spread their risk. I doubt you’ll see a huge explosion in SF population in the next 20 years. Expect more domestic outsourcing to more affordable areas of the country. Agreed. No huge SF or Bay Area population explosion. Even now there is just modest growth. At one time SF was a significant banking center until it wasn’t and banks moved their labor intensive groups out of the City. Oakland took shipping from SF and was to be the shipping center of the West Coast till Seattle and LA/Long beach became increasingly significant shipping centers. Reducing Oakland’s importance. And now? LA/Long Beach is set to lose a big chunk of its business to the Port of Virginia and other East Coast ports with the canal expansion. The same will happen with hi-tech. The headquarters and top paid execs will remain in the Silicon Valley but the overall workforce of these companies will decrease as a percentage in the Bay Area vs other areas. Too many think the Bay Area will remain the tech capital of the country forever. Just recall, nothing lasts forever. Growth rates are slower because of self-imposed development regulations (driving up prices), nothing more. In part. Don’t disagree. But should Mt. San Bruno be paved over with ticky tacky homes? Or the beautiful greenbelt along most of 280 from DC to SJ be turned into malls and row homes? Beyond that, SF is not a great jobs magnet. Lennar HP is having trouble leasing their 2 or 3 million square feet of space. Except to public entities or private academies. Wander north of market in the “old” financial district and look at all the for lease signs. Is this supposed job growth in SF a smokescreen to allow development of more office space than is really needed? . Long term and beyond the current hi-tech boom that seems to be slowing. Just wondering. Dave, please note lease rates and occupancy rates. There is nothing “wrong” with either in SF, unless you consider “highest ever” to be a sign of a market in trouble. And no, I don’t agree with paving over our regional treasures. Hence the reason I advocate removing all height limits in ALREADY developed areas. I don’t know if you’ve noticed, but SF is probably the best job magnet of any city in the country right now, if not the world. Please, tell me what cities are hotter. Let me pile on. You really have to wonder which planet Dave is on. The other day he thought Mission and 3rd was “off the beaten path”. 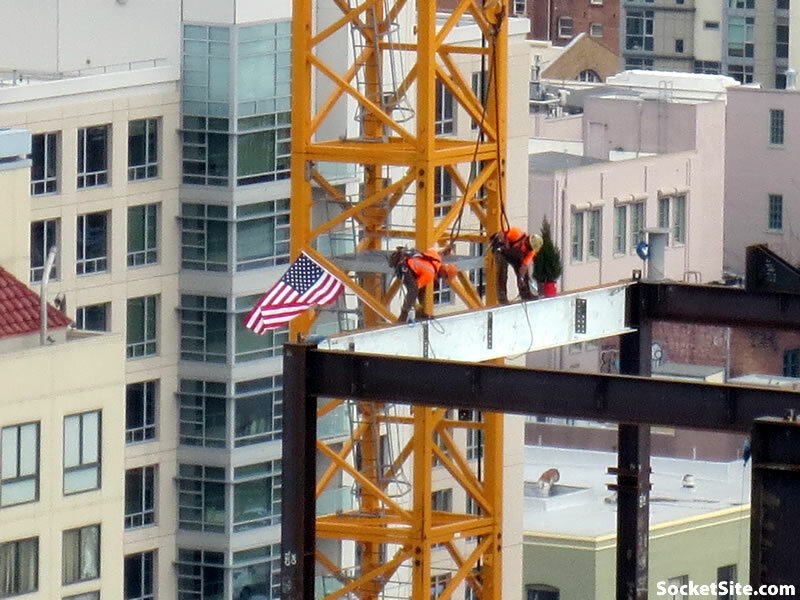 Now it is SF Bay Area waning and the 3% unemployment is only a smoke screen for the developers. . I suppose anybody who thinks construction moratorium is a solution to the housing problem is a suspect. The hospital actually has LESS beds than the hospital it replaces in pac heights. The height was only cut down about 50′ – mostly due to the nurses union holding out. What are the plans for the Pac Heights campus once Van Ness opens? I suspect that depends on sales of the condos in the reno of the dental school or whatever it was just down the hill. At a presentation by CPMC to the Cathedral Hill neighborhood about three or four years ago, the plan for Pac Heights, as well as the Laurel Heights campus land, was senior housing. I don’t know if that’s changed or not. But, once again, the new St. Luke’s, also abuilding across town as part of a combo project, will have more beds than what it replaces or what was initially planned before the size of this building was cut. Yes, but that decision was a political one, not one made independently by the hospital. That’s it? I thought it was going higher. That’s ridiculous. Why the incessant need to go higher in SF? SF is not NYC or Chicago or Houston or LA or even Seattle. All cities go towards century plus towers. SF will never compete in that arena nor should it. I keep asking the same thing, Dave: there seems to a continual vocal group here who simply worships height limit increases all over The City, with no logical reasoning or intelligence behind their desires. We are none of those cities you mention, nor do we want or need to be. Thankfully, we are unique among American cities for our quality of life and livable human scaled neighborhoods. Give it a rest you two. There are a lot of folks on this site who support height increases who give plenty of solid reasoning behind their comments. Dave, where’s your logical reasoning or intelligence behind your comment? Futurist appears content with the status quo because he owns property in his livable human-scaled Noe Valley neighborhood where the quality of life for him is apparently great. Thankfully, they are on here to speak for every taxpaying citizen of SF. Give what a rest Mark? Our opinions? Fact is, going back for the years I have been here commenting on SS I have ALWAYS supported growth and change in SF: it’s what makes cities great and keeps them dynamic and alive. I take aim, primarily at those who simply ALWAYS want increased height limits on anything: if a new building is 40 stories, they want 60: if it’s 60, they want 80, and on and on. For no logical reasons. Height limits are put in place for sound, logical urban planning and architectural reasons: modulating the scale of neighborhoods or clusters, working with and respecting existing context, appropriate use, etc. And by the way, I am seeing plenty of growth and change in our neighborhoods, including my own. More additions and new houses are going UP to the allowable height limit of 40′, which for many neighbors seems outrageous. they seem to forget that their little one story cottage is ALSO zoned for 40′. I support that kind of growth as neighborhoods continue to change. Think of all those urban hellscapes created before we had height limits, like pretty much all of SF. Good god, horrid place. Um, your neighborhood was built before height limits were in place. That was my point. Puh-lease, I am *not* one of the “build it higher” crowd. I’m the one who’s always arguing on here there a consistent 5- or 6-story level of development across SoMa or along Geary is far better – and far more consistent with high-quality walkable neighborhoods the world over – than Vancouveresque intermittent glass towers. But here, (1) the hospital itself originally wanted higher, and (2) there are as high and higher buildings all around here, from Cathedral Hill to the senior housing right across the street, and the new residential being built along Bush. Not going higher here is a lost opportunity. Ok, I’m will to play with you: why I have no idea, ,maybe it’s because I’m full of holiday cheer. SF: pop: 852,469. area: 46.27 sq. miles. Density; 18,187 per sq. mile. Seattle: pop: 608,000. area; 142 sq. miles. density: 7669/sq. mile. Comparing EXACTLY city to city, not city to burbs or city to region. Not meaningless. just real. So, again: How is SF NOT comparable to those two cities you mentioned? When I talk City, I mean CITY OF SAN FRANCISCO. Futurist, I enjoy reading your comments. This does not seem like a very cheerful post, though I could be wrong. Nevertheless, why the obsession with CITY OF SAN FRANCISCO when the boundaries are a result of historical quirks rather than most of the things that might be considered in regional planning (e.g. movement of persons and goods via transportation networks, regional job market, other measures of regional economies, etc…) that many of the posters here clearly consider relevant to building heights? I’m curious because you seem to feel very strongly but don’t really explain. Thanks LJL: for the most part, I enjoy posting here and listening to comments. To be fair, though, I almost always throw in a bit of sarcasm and irony when I comment. sometimes to specific people. I’m not obsessed with San Francisco, except that I’m really ONLY interested in our growth and scale change, vs the suburbs. I live here, most of the commenters live here and living here is what is affected by physical change. The suburbs have their own challenges and quite frankly, I don’t care what they do. I suspect they primarily want to remain suburban with open space, houses on large lots and low rise buildings. That’s their choice and I don’t question that. My primary comments revolve around how we ( San Francisco city) grows in a responsible and careful way WITHOUT destroy the existing character that almost all of us really love and enjoy. It doesn’t mean I’m a NIMBY, which I’m not. It doesn’t mean I’m an old fart resisting all change. It means I want us to retain our unique characteristic of a livable American city with small scale neighborhoods, walkable streets, and humanness. We can grow with high rises in selected areas, but not all areas. We don’t need to grow endlessly just to satisfy some unrelenting need to house everyone and anyone who wants to live here. Sorry, we just don’t. We should ONLY grow when our transit systems are built up to accommodate that growth. I gave you a few reasons why I am very careful about unbridled growth. Now ask the same people why they continue to ask for increased height limits, more and more high rises, without justification and valid transit to accommodate that. We are losing all the things you like about SF precisely because we are not taking advantage — because we did not take advantage, the opportunity is now almost fully squandered –of a large semi-industrial undeveloped area from SOMA to Bayview. Concentrated development, dense development, of that area would have changed SF’s character in that area. Failing to do that has altered the entire city and will continue to do so as the pressure of increased population and the out-sized wealth of a subpopulation of tech workers continue for decades to come. And don’t pretend that you only argue against height in selected areas. It’s virtually you’re talk-down-to-them mantra on here. Sorry, wrong. City limits mean nothing. City limits ARE city limits, anon. Except when you don’t want them to be. Unfortunately our political realities reverse this causation. We have to increase density before subways can be built. It is kind of sad that we have to endure this lag in transit build-out but that is what happens when we have the “drive everywhere” sentiment directing our political process. It wasn’t that long ago when developers could build streets without sidewalks or bike lanes because “why would anyone want to walk or bike?”. MOD. SF has always been a city where people walk a lot. many former or event current car or motorcycle centric people have been pushing for better public transit for some time. many don’t have an alternative than to use cars because the transit is so poor. City limits are fine as city limits, Futurist. But when comparing infrastructure of a regional scope (like $2 billion hospitals and 100 story buildings), a regional scope should be used for comparisons. Moto – My comment was about the agencies who fund regional transportation planning, most of which lie outside of the 7×7. It is a lot harder to fund a new branch of BART down Geary than it is to remodel ten freeway interchanges even though they cost about the same and the first one has a greater and more sustainable impact. Neither is NYC Chicago, nor Houston Seattle, etc. etc. The only distinction you seem to draw here is that other cities have high rises but we don’t, which is not much of an insight as it says nothing about the underlying reasons for this difference in building heights. You seem very confident in asserting what SF will and should do on the basis of this lack of an argument, however. I don’t understand where your confidence comes from. Not to mention that it’s completely illogical that cities with lower density would have far more, far taller towers. SF should go higher so that land isn’t paved over with ticky tacky homes. Calling homes “ticky-tacky” is only a narrow minded judgement of design. If they were all Modern would you be happier? what about all Tudor? or all Colonial Revival? or Mission Style” or International Style? or Shingle style? Which one would satisfy you then? I agree with you on this one, and apologies for using the word obsessed above. I think that one of the factors limiting transit improvements has been the hyper-local planning that occurs around here and I doubt that SF by itself will be able to seriously improve transit by much. I’m basing this mostly on hearsay and what I’ve read on this site and SPUR.org so I could be wrong. But, despite the MTC, trying to coordinate and transfer between Caltrain/BART/Muni/ETC is often a major hassle, expensive, and time-consuming. Bobn: I was parodying the song. With the affordable care art and some of SF population moving south to Noe Valley, etc, CPMC’s business plan supported the current Cathedral hill hospital (smaller than original) and a slightly larger St Luke’s hospital. That is what CPMC is building. It’s been really interesting to watch this building go up. This is effectively the view out of my living room window. It’s definitely not as tall as I thought it was going to be (hello, renderings that included the underground parking garage in the total height). I’m going to be curious as to the cladding on the Franklin elevation. I’ve only really seen one photo of it from a flyover video, and it wasn’t nearly as glossy as the marketing materials for all of the other views (it’s the loading dock side). There is also a surprisingly tall “cap” above the occupied floors that wasn’t that evident from the marketing materials either. As to dense development in SOMA to Bayview – isn’t that what we are getting? And won’t that accommodate the growth which is supposed to top out at a million in 20 years or so. Another 125K plus residents. SOMA built to current height limits could accommodate thousands of new units. I believe Jake gave an actual approximate number a while back. So, as is, there does not seem to be a need to increase the density in traditional areas of SF that so many love. A real increase in density above what is already in place should only have happened with a world class project such as the Pei proposal from decades ago. Cleveland is doing a lakefront project which will be taller and more dense than Mission Bay but it is a far better design than Mission Bay and worthy of that particular location. When you pre-define exactly where and how growth will go, you never know what you’ll miss. And you’re guaranteed of everything being high end, since the extremely small number of development sites will just go dormant with any thought of prices plateauing. Upzoning even just all of SOMA could lead to who knows how much additional development, let alone a blanket upzoning of say, everything fronting Geary to the ocean to 6-8 stories. It wouldn’t have to mean upzoning Noe Valley or something like that – just a wider upzoning across a large number of parcels not currently owned by large developers. Are we really arguing about whether to force a hospital to build bigger? Some of the zealigogory on this site is, well, topped out. No, we’re arguing about whether to force a hospital to build smaller, which is what happened in this case. A Christmas tree on the top does not mean is is topped out. It means there’s a Christmas tree on the top. That’s true. But in this case, it was part of the official topping out ceremony (as we reported above).